I don’t know why there were this kind of cars all over Berlin… maybe it’s a tourist thing? 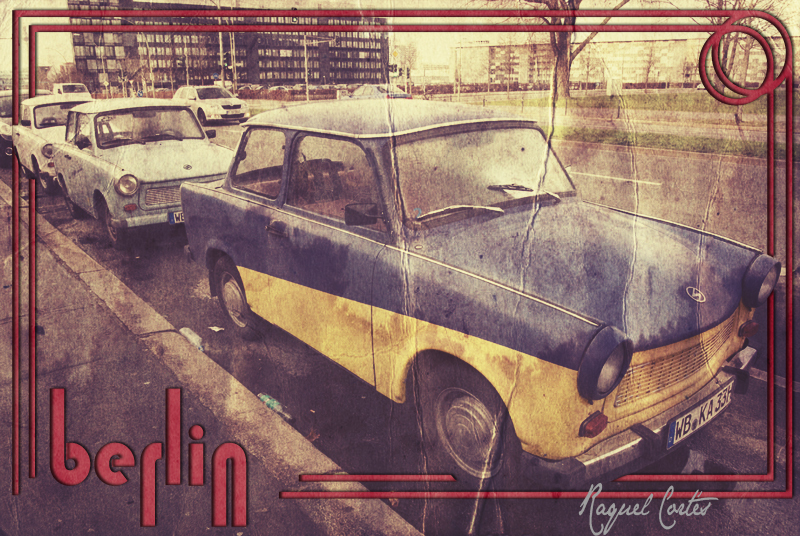 Anyway, these three cars were great to make this postcard, half a photograph, half something else. I wanted to give it an old and kitsch look. Aah… the good old days with their good old cars. No sé muy bien por qué había tantos coches de este estilo por todo Berlín… ¿quizá por algo turístico? Sea como fuere, estos tres coches eran geniales para hacer esta postal, mitad foto, mitad lo que sea. Quería darle un aspecto un poco viejo y “kitsch”. Aah… los buenos y viejos tiempos con sus buenos y viejos coches. The cars you saw are Trabants (or short: Trabis). Until now, they represent the most common type of car in the east. Effectively, they’ve become more of a tourist attraction nowadays, since they are not used for private transport anymore. Are they remnants of East Berlin?